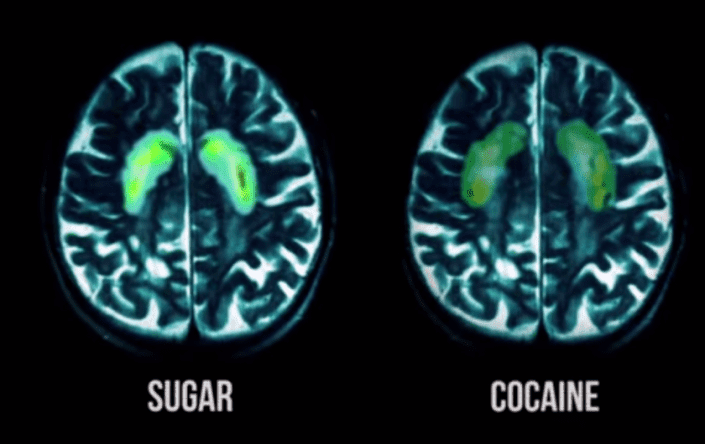 This is your brain on drugs…I mean Sugar! Fact: In fact these days the average American consumes 22 teaspoons of sugar a day. The average child consumes 32 teaspoons of sugar a day. In the late 70’s two things happened. American’s were led to believe fat was bad (change in Food Policy). And because of this food manufacturers began replacing it with High Fructose Corn Syrup because it was cheap, made their products irresistible to us and had an added bonus of keeping the “phude” from spoiling (HFCS’s literally poison the bacteria!). So it’s probably no coincidence that global sugar consumption doubled from 1985 to 2010. During that same time, the global rates of diabetes and obesity went through the roof. This is evidence that Fat Doesn’t Make us Fat, Sugar does. And what makes us fat makes us sick, too. Sugar is at the root of our chronic disease epidemics: heart disease, cancer, dementia, type 2 diabetes, depression, and even acne, infertility and impotence. But here’s the kicker: New research shows that sugar is eight times as addictive as cocaine. Some dudes at Harvard proved that high-glycemic foods (those that raise blood sugar more quickly) trigger the same pleasure center in your brain as cocaine and gambling addictions. When this region is activated it makes us feel good and drives us to seek out more of that feeling. 1. Eat every 2-3 hours. Letting yourself get too hungry is a disaster for sugar cravings. So eating 5-6 balanced meals and snacks throughout the day will do wonders for balancing your blood sugar. 2. Eat protein at every meal, especially breakfast. Another scientific key to balancing your blood sugar and insulin release. Start the day with a protein shake or whole pasture-raised eggs. And use nuts, seeds, eggs, fish, chicken or grass-fed meat for protein at every meal. Remember a serving size is 4-6 ounces or the size of your palm. 3. Make friends with Fat! Fat doesn’t make you fat. You just have to choose the right kinds, like nuts, seeds, extra virgin olive oil, avocado, and unrefined coconut oil. Getting enough fat in your meals will help you feel fuller longer and provide nutrients your cells need to function properly. 4. Chill Out. Stress can take over our lives. It can also make you hungry and store fat no matter what your calories in – calories out formula yields. We all need to find ways to manage stress and stop living in a chronic “fight or flight” mode. Click HERE to get my How To Take A Chill Pill Guidebook. 5. Be Anti-Inflammation. Silent inflammation in the body is inflammation that doesn’t cause you any physical pain, but over time can lead to disease and weight gain because it triggers insulin resistance and blood sugar imbalances. Sugar is a known source of inflammation. But two other very common, but often ignored, sources of inflammation are Gluten and Dairy. If you’re thinking you’d rather jump off a building than quit sugar, gluten, AND dairy…then my guess is you’re probably addicted, ha! Still, I understand. It can be tough to eliminate or cut down on these things. And we often crave the foods we’re allergic to. But here’s the good news. After just 2-3 days of detox, you can feel relief from the cravings, have an insane amount of energy, and have the confidence to keep going with your health goals. Also, don’t underestimate the power of community when it comes to kicking sugar. You’re much more likely to succeed if you have a buddy doing it with you. So go ahead, grab a friend or family member and give these 5 strategies a try. If you want more support and guidance, email me. That’s what I’m here for. Or if you know you’re ready to quit, take action now and sign up for my 5 Day RESET program HERE. Registration closes Friday, May 9th. We’re detoxing from May 19th – May 23rd. It’s a group thing and I’m doing it, too. Hope to “see” you there.